Mol. Cells. Jan 31, 2019; 42(1): 28-35. Animals need to be able to alter their developmental and behavioral programs in response to changing environmental conditions. This developmental and behavioral plasticity is mainly mediated by changes in gene expression. The knowledge of the mechanisms by which environmental signals are transduced and integrated to modulate changes in sensory gene expression is limited. 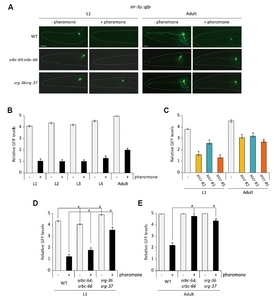 Exposure to ascaroside pheromone has been reported to alter the expression of a subset of putative G protein-coupled chemosensory receptor genes in the ASI chemosensory neurons of C. elegans ( Kim et al., 2009; Nolan et al., 2002; Peckol et al., 1999). Here we show that ascaroside pheromone reversibly represses expression of the str-3 chemoreceptor gene in the ASI neurons. Repression of str-3 expression can be initiated only at the L1 stage, but expression is restored upon removal of ascarosides at any developmental stage. Pheromone receptors including SRBC-64/66 and SRG-36/37 are required for str-3 repression. Moreover, pheromone-mediated str-3 repression is mediated by FLP-18 neuropeptide signaling via the NPR-1 neuropeptide receptor. These results suggest that environmental signals regulate chemosensory gene expression together with internal neuropeptide signals which, in turn, modulate behavior. Crude pheromone contains ascaroside pheromone components including ascr#2, ascr#3, and ascr#5 ( Supplementary Fig. S1)(Butcher et al., 2007; 2008). We previously showed that these chemically synthesized ascaroside pheromone components down-regulated str-3 expression in the ASI neurons when worms were exposed to each of these pheromone components from egg to the adult stage (Kim et al., 2009). We next determined whether these pheromone components could repress str-3p::gfp expression at the different developmental stages. Similar to crude pheromone, mixtures of ascr#2, ascr#3, and ascr#5 down-regulated str-3p::gfp expression in the ASI neurons when animals were exposed to pheromone mixtures from egg to the each developmental stage in a dose-dependent manner (Figs. 2A and 2B, Supplementary Fig. S2)(Kim et al., 2009). Moreover, similar to crude pheromone, each pheromone component significantly repressed str-3 expression when animals were exposed from egg to the L1 stage or the adult stage (Fig. 2C)(Kim et al., 2009). We noted that the GFP levels in the adults were higher than those in the L1 worms in the presence or absence of pheromone (Fig. 2C). 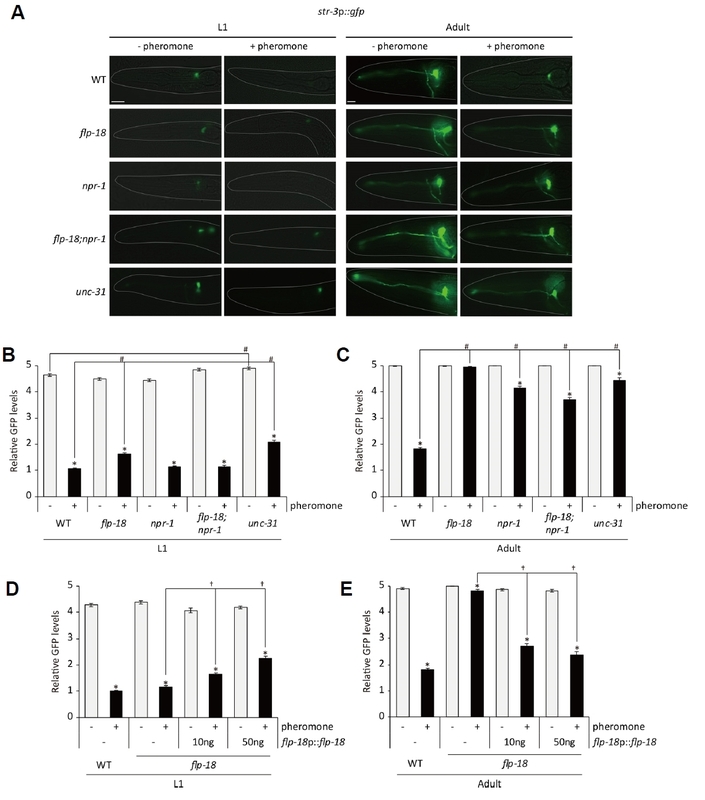 Taken together, these results indicate that repression of str-3 in the ASI neurons requires early exposure to pheromone components. FLP-18 neuropeptides play various physiological and developmental roles via neuropeptide receptors including NPR-1, NPR-4, and NPR-5 (Cohen et al., 2009; Rogers et al., 2003). We next asked which neuropeptide receptors couple to FLP-18 neuropeptide to mediate pheromone-mediated str-3 repression. We found that str-3 expression was not down-regulated upon pheromone exposure in npr-1 (ad609 ) mutants (Figs. 4A-4C). Although npr-5 mutants exhibited defects in dauer formation (Cohen et al., 2009), str-3 repression was either weakly or not affected in npr-4 (tm1782) or npr-5 (rb1393) mutants ( Supplementary Fig. S3). Taken together, FLP-18 mediates str-3 repression at least partially via the NPR-1 neuropeptide receptor but not the NPR-4 and NPR-5 receptors. In this study, we further analyzed conditions in which expression of a chemoreceptor str-3 gene is modulated via pheromone together with FLP-18 neuropeptide signaling. Since srbc-64/66 pheromone receptors act in the ASK chemosensory neurons to detect ascr#2 and ascr#3 (Kim et al., 2009) and str-3 is expressed in the ASI chemosensory neurons, FLP-18 could transmit signals from the ASK to the ASI neurons to regulate str-3 expression. However, flp-18 is not expressed in the ASK and other chemosensory neurons (Rogers et al., 2003), suggesting that FLP-18 play a different role in pheromone-mediated str-3 expression. Since expression of several chemoreceptor genes including str-3 is altered in the presence of pheromone, it is plausible that pheromone could eventually change chemosensory behavior( s) which the chemoreceptors play roles in. We examined attraction behavior to odorants including benzaldehyde and diacetyl (Bargmann et al., 1993) and found that compared to control animals, pheromone-treated animals did not exhibit altered chemotactic behavior to these odorants ( Supplementary Fig. S4). These results indicate that chemosensory behaviors are not broadly affected by addition of pheromone but str-3-mediated chemosensory behavior(s) may be modulated in the presence of pheromone. Investigating site of FLP-18 action and identifying str-3 gene function would be the next step to understand this pheromone-mediated gene expression plasticity. Mol. Cells.Jan 31, 2019; 42(1): 28-35. Received September 18, 2018; Accepted October 17, 2018. Ludewig, A.H., and Schroeder, F.C. (2013). Ascaroside signaling in C. elegans. WormBook. , 1-22. Robertson, H.M., and Thomas, J.H. (2006). The putative chemoreceptor families of C. elegans. WormBook. , 1-12. (A) Experimental diagram of str-3 repression by crude pheromone exposure at each developmental stage. (B) Fluorescence images of GFP in the ASI neurons of str-3p::gfp transgenic animals taken at the adult stage in the absence or presence of crude pheromone. (C) Relative percentage of str-3p::gfp expression in the ASI neurons of animals at each developmental stage after exposure to crude pheromone during the indicated stages of development. (D–E) Relative percentage of str-3p::gfp expression in the ASI neurons of young adult animals that were exposed to crude pheromone during the indicated stages of development. (C–E) Black vertical bars indicate time of observation. n ≥ 30 for each. The scale bar represents 10 μm. (A) Representative images of srbc-64;srbc-66 and srg-36 srg-37 double mutants expressing the str-3p::gfp transgene in the ASI neurons at the L1 (left panels) and adult stage (right panels) upon exposure mixtures of 1 μM ascr#2, ascr#3, and ascr#5. (B–C) Relative GFP levels are shown upon exposure to mixtures of 1 μM ascr#2, ascr#3, and ascr#5 (B) or individual 1 μM ascarosides (C). (D–E) Relative GFP levels of str-3p::gfp expression in srbc-64;srbc-66 and srg-36 srg-37 double mutants at the L1 (D) and adult stage (E) upon 1 μM ascaroside pheromone mixtures. n ≥ 30 for each. The scale bar represents 10 μm. Error bars represent the SEM. * and # indicate different from the controls (absence of pheromone and wild-type animals, respectively) at P < 0.001 (Bonferroni t-test). (A) Relative GFP levels of str-3p::gfp expression upon exposure to 12.5 μg or 25 μg live or heat-killed OP50. (B) Relative GFP levels of str-3p::gfp expression upon exposure to 12.5 μg or 25 μg live OP50 cultivated on noble agar plates. (C) Relative GFP levels of str-3p::gfp expression after starvation for 24 h. (D) Relative GFP levels of str-3p::gfp expression following cultivation at 15°C, 20°C, or 25°C at the L1 or adult stage. n≥ 30 for each. Error bars represent the SEM. (A) Representative images of flp-18, npr-1, and flp-18;npr-1 mutants expressing the str-3p::gfp transgene in the ASI neurons at the L1 (left two panels) and adult stage (right two panels) upon exposure to mixtures of 1 μM ascaroside pheromone. 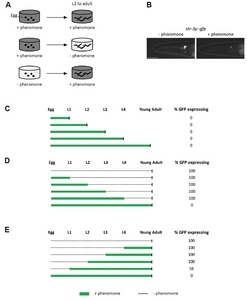 (B–C) Relative GFP levels of str-3p::gfp expression in flp-18, npr-1, and flp-18;npr-1 mutants at the L1 (B) and adult stage (C) upon exposure to mixtures of 1 μM ascaroside pheromone. 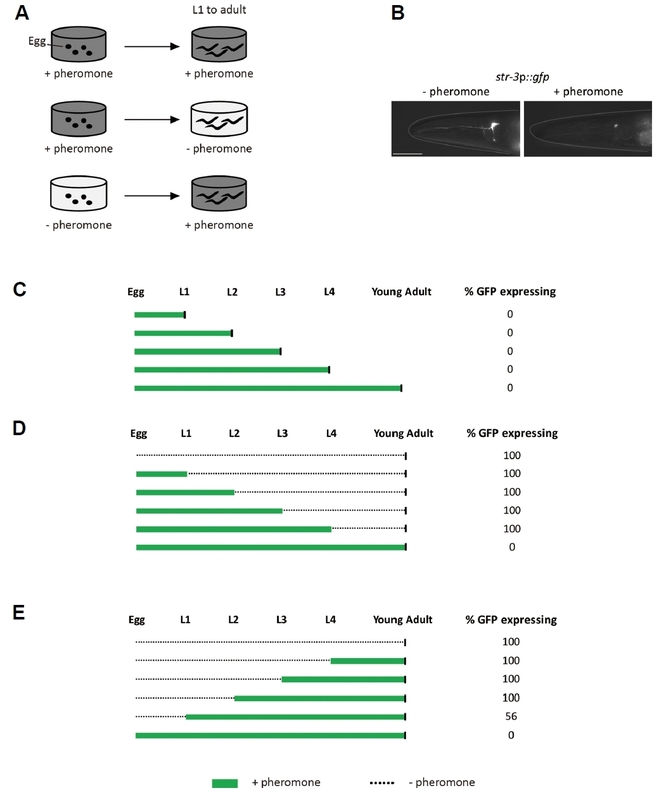 (D–E) Relative GFP levels of str-3p::gfp expression in flp-18 mutants expressing flp-18 genomic DNA driven by its own promoter upon exposure to mixtures of 1 μM ascaroside pheromone. n≥ 30 for each. Error bars represent the SEM. *, #, and † indicate different from the controls (absence of pheromone, wild-type animals, and no transgene, respectively) at P < 0.001 (Bonferroni t -test). The scale bar represents 10 μm.